What do you hope to accomplish during your year of service to Missouri FFA? I hope to encourage members to step out of their comfort zones and encourage youth from all backgrounds, both rural and urban, to seize the opportunities that this organization provides. What or who motivates and inspires you and why? My community inspires me. As a small community, they have always had a direct agricultural tie, meaning that almost everyone farms or works for the agriculture industry in some shape or form. They are active in the lives of youth and help to the fullest extent. It’s great to have a community so supportive of FFA and that encourages active youth involvement. My future plans are to graduate from Northwest with a degree in Agricultural Education with a leadership emphasis, then teach somewhere around my hometown. I love sharing my passion for this industry, and I believe that being an educator is a good way to do it. I also would like to help with the agriculture educator deficit and give back to the industry that has consistently provided for both me and my family. What is something unique or interesting that few people know about you? Something interesting about me is that I love to sing! 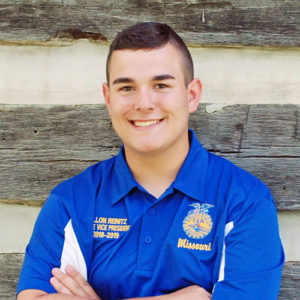 This is my favorite hobby, and I have auditioned for both “America’s Got Talent” and “The Voice.” Singing got me interested in public speaking, which is my favorite FFA Leadership Development Event. Members, my advice to you is to take a step out of your comfort zone and try something new. I would have never gotten involved in FFA had my advisor not encouraged me to do something that I maybe wasn’t so comfortable with. Run for office, try giving a speech, and apply for summer academies. Everyone has a chance in this organization, and its whether we take risks and strive for greatness that will determine our end success. I promise that if you take that big step, you will reap the full benefits of being a Missouri FFA member!